Making her worldwide debut at this year’s Cannes Yachting Festival is the new Outer Reef Yachts 24 Meter - a must-visit appointment while at the show. At 78’8” LOA, the 24m shares the same underwater profile and superstructure of the Outer Reef 800 but has been fully customized for a European client. The hull is a Class A, semi displacement at 81.64 tons, with power coming from twin Caterpillar C12’s delivering a combined output of 1410 bhp and a maximum speed of 14.5 knots with optimal cruising speed of 10 knots. 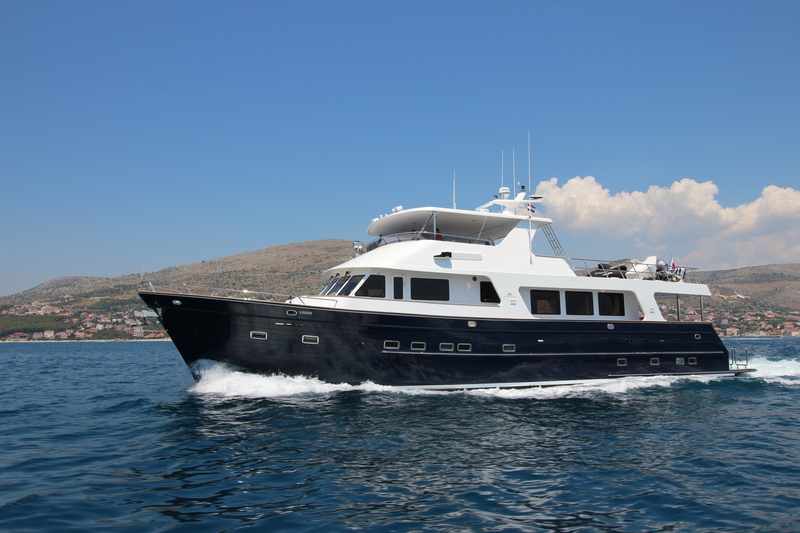 Whilst the yacht’s primary market is for the explorer, adventurer and long distance cruiser, and with the OR 800 hull being a very capable yacht in a range of sea conditions, this model has also been designed for a client who loves entertaining with an equal emphasis on cordon-bleu style cooking, fine wine and music. The owners have commissioned state of the art professional galley equipment, together with a $280,000 concert hall-style entertainment system, making this one of the most alternative and exciting “Go Anywhere” offerings to be exhibited at this year’s show. The configuration of the main deck salon is designed for high level entertainment. The interior is expansive, with 6’8” headroom and likened to similar interiors of a significantly larger super yacht, with a Wenge and Walnut finish, and is contemporary in design and feel. Contained within this, is a u-shaped settee for up to ten guests with full access to the entertainment system and drinks bar area and positioned conveniently next to the galley which, in turn, has direct access to the pilot house. 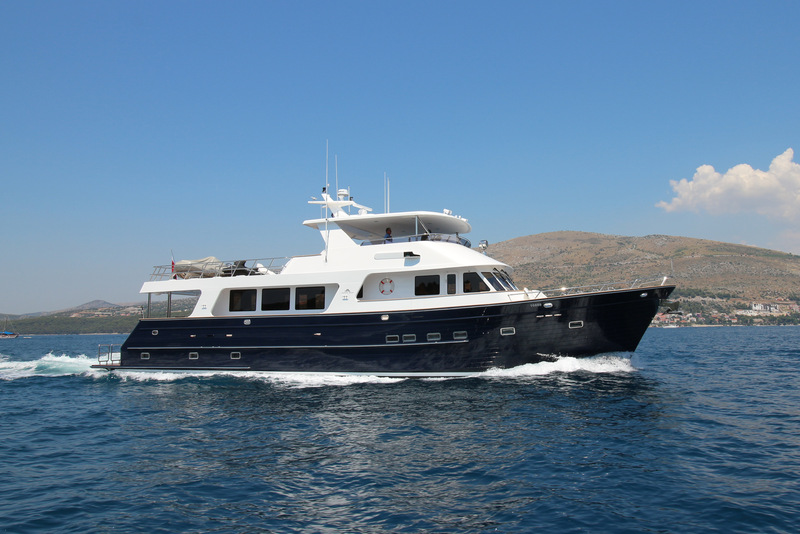 Trevor De Faoite, Outer Reef’s European sales director commented, “We have delivered a classic yacht with a modern and unique twist, to an exemplary level. And, to my knowledge, this combination is unprecedented in this boat genre anywhere in the world”. A full WheelHouse™ Technologies and Marine Maintenance System enables the owner operator full operational control. However, there is an option to employ four crew and the vessel offers exceptionally comfortable and congenial surroundings for all, including a full beam Master Stateroom on a flat floor, with his and her’s ensuite facilities, together with two double berth VIP guest state rooms also ensuite. There is capacity for fourteen berths including crew, in total. Whilst creature comforts and a home-away-from-home feel are top priorities, security is also paramount, and initial sea trials concluded that even when water and fuel tanks were empty, the overall stability remained excellent. Designed with a walkaround fully sheltered main deck leading to a Portugese bridge, in front of the fully weather proofed Pilot House, the yacht offers ample safe areas to operate in, during bouts of inclement weather. There are fore and aft decks, which complete the main deck layout, clad with teak and will accommodate sun bathing and luxury dining facilities respectively. On this model, a fighting chair on the aft deck has also been fitted. The Flybridge is based on the exclusive Deluxbridge® full beam width deck which has also been fully teak decked and offers second helm position and seating for ten with full hospitality units including BBQ, near at hand. The boat deck is aft of the fly bridge with enough space for a tender and PWC, both managed by a fully rotational Davit complete with a 12’ arm extension and with lifting power of 800 kilos/1700lbs. The OR 24 Meter comes with all the trimmings of a fun filled, luxury home without the need to compromise on all weather and sea condition versatility.